A Game of Thrones is the comic book adaptation of George R. R. Martin's fantasy novel A Game of Thrones, the first in the A Song of Ice and Fire series. A sequel, A Clash of Kings, was announced in March 2017, based on the book of the same name. The comic book series was scripted by fantasy author Daniel Abraham and drawn by Tommy Patterson. It is intended to follow the story and atmosphere of the novel closely, at a rate of about a page of art for each page of text, and was projected to cover 24 issues of 29 pages each. George R.R. Martin advised Daniel Abraham on aspects of the adaptation. not knowing what might become significant in the as-yet unwritten sixth and seventh novels in the Song of Ice and Fire series. The initial issue was published by Dynamite Entertainment in September 2011. New issues are published at a rate of one per month. The first six issues were published as a trade paperback, marketed as a graphic novel, on 27 March 2012. It took first place on the New York Times best-seller list for graphic books the day after its publication. The series currently holds a score of 6.4 out of 10 on the review aggregator website Comic Book Roundup, based on 26 total reviews for the series' 24 published issues. The highest-rated issue was #4, with a score of 9.6 derived from one review, while the lowest is issue #23, with a score of 2.0, also based on one review. Initial reviews of the adaptation were mixed. IGN rated the first issue as "passable", acknowledging the writing and art as competent, but considered the character design to be "overly pretty and slightly exaggerated" and the series as a whole to lack added value with respect to either the original novel or the HBO series. Weekly Comic Book Review gave the first issue a "B-", appreciating Patterson's art but finding the colors to be inappropriately bright and shiny. Broken Frontier reviewed the "enjoyable adaption" favorably, but asked for "a tighter focus on characters over plot points, and a more serious take on the art". While they appreciated Patterson's settings, they considered that his art dipped in quality when it came to facial expressions, making characters appear distracting and misshapen. Comic bloggers Geek of Doom praised the comic, concluding that it communicated the book's depth better than the TV series did. The Courier News's reviewer, on the other hand, dismissed the adaptation as presenting "a world filled with fantasy cliches, void of style and indistinguishable from any other mediocre book dubiously depicting the middle ages". On March 2017, a comic book adaptation of A Clash of Kings has been announced and was available June of the same year. ^ Allen, Todd (21 March 2017). "More Game of Thrones Comics – A Clash of Kings Gets an Adaption in June". Comic Book Resources. Retrieved 5 December 2017. ^ Sunu, Steve (21 September 2011). "Abraham Plays "A Game of Thrones"". Comic Book Resources. Retrieved 1 October 2011. ^ Abraham, Daniel (16 December 2011). "Ignite New Mexico: Adapting Game of Thrones". Retrieved 19 December 2011. ^ a b "Comic Review: A Game Of Thrones #1". Geeks of Doom. 21 September 2011. Retrieved 1 October 2011. ^ "First look: GAME OF THRONES: THE GRAPHIC NOVEL VOLUME 1". Comics Beat. 13 December 2011. Archived from the original on 29 July 2012. Retrieved 20 December 2011. ^ Gustines, George Gene (6 April 2012). 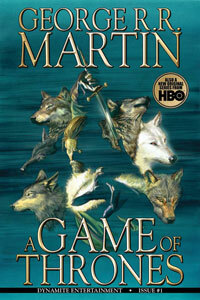 "Graphic Books Best Sellers: 'Game of Thrones' and the Avengers". New York Times. Retrieved 8 April 2012. ^ "A Game of Thrones". Comic Book Roundup. Retrieved May 31, 2015. ^ Schedeen, Jesse (21 September 2011). "A Game of Thrones #1 Review: The popular fantasy epic jumps from books to TV to comics". IGN. Retrieved 19 December 2011. ^ "A Game of Thrones #1 – Review". Weekly Comic Book Review. 26 September 2011. Retrieved 19 December 2011. ^ Yell, Joshua (21 September 2011). "A Game of Thrones #1 Review". Broken Frontier. Archived from the original on 16 October 2011. Retrieved 19 December 2011. ^ Clyma, Jason (27 October 2011). "A Game of Thrones #2 Review". Broken Frontier. Archived from the original on 18 January 2013. Retrieved 20 December 2011. ^ Re, Michael (20 December 2011). "Three's a crowd: Latest 'Game of Thrones' is one too many". Courier News. Retrieved 23 December 2011. ^ "GEORGE R.R. MARTIN'S A CLASH OF KINGS #1". June 2017. Retrieved 5 December 2017.